At Swift Transportation, our mission is to attract and retain customers by providing Best in Class transportation solutions and fostering a profitable, disciplined culture of safety, service, and trust. Swift’s terminal network has grown to over forty full-service facilities in both the continental United States and Mexico. Swift owns 100% of Trans-Mex, a Nuevo Laredo, Mexico based carrier. Swift offers border crossing services at all major Mexican border crossings. Swift maintains a presence in every Canadian province each day. Swift is unquestionably the largest full-truckload motor carrier in North America. You’ve served your country proudly. Your next step should be the start of an exciting new journey. Swift recognizes your service and want you to join our force. You’ll get the financial security you deserve, with comprehensive training from a team of strong, dedicated leaders. Veterans can even receive a full scholarship to our Swift Academy and can take advantage of our nationally approved Military Apprenticeship Program. It’s a commitment to your success that really goes the distance. 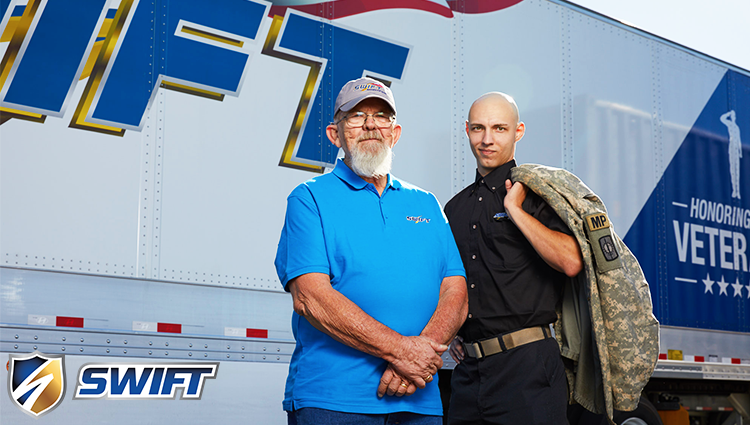 Take advantage of Swift Transportation's commitment to your service. Request info now on how you can join the team!